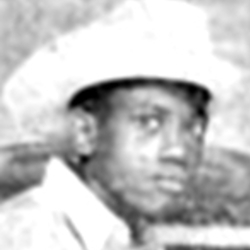 Joseph “Joe-Ed” Edwards, a porter at the Shamrock Motel in Vidalia, Louisiana, was 25 years old when he disappeared on July 12, 1964. The Shamrock was the center of activity for the violent Klan organization called the “Silver Dollar Group.” Each member carried a silver dollar with the date of his birth as an identification of group membership. The group had working crews who conducted severe beatings and killings. A week later, Edwards’s car was found on the levy near Ferriday, Louisiana. Law enforcement officials reportedly found a noose and blood in the car. The local sheriff, who was identified as a member of the Klan, refused to treat the case as a murder investigation. Joseph Edwards’s mother, Bernice Conner, filed missing persons reports on her son and was interviewed in November, 1964, by the Mississippi Highway Patrol, but the law enforcement organization made no further contact with her. CCJI conducted research in 2007 to find out what happened to Joseph Edwards. The FBI and U.S. Attorney’s office denied any reports existed. In 2009, students from CCJI, while photographing 7,000 documents from another file, discovered hundreds of pages of FBI reports filed in 1967 on the “Joseph Edwards Murder Investigation.” These materials were turned over to the FBI, the U.S. Attorney’s Office, the Justice Department and the local law enforcement offices, but no official case has been opened or reopened. Connor died without knowing anything more about her son’s disappearance.